The Air Logic Division of Fred Knapp Engraving Company designs and manufactures a comprehensive line of pneumatic and vacuum control equipment – sensing and input elements, control elements, and output interface devices. The control elements include both fluidic and moving diaphragm control components, each to be used for their own advantages. Components include Precision Pressure Regulators, Inline Filters, and Pressure & Vacuum Switches. Normally open & normally closed pressure and vacuum piloted valves are also featured. Pneumatic accessories include Preset Flow Controls, Needle Valves, Check Valves, and Orifice Restrictors. A complete line of Plastic Fittings is also available. Air Logic designs and manufactures a comprehensive line of Precision Regulators and Manifold Blocks that are ideal for instrumentation and medical applications. 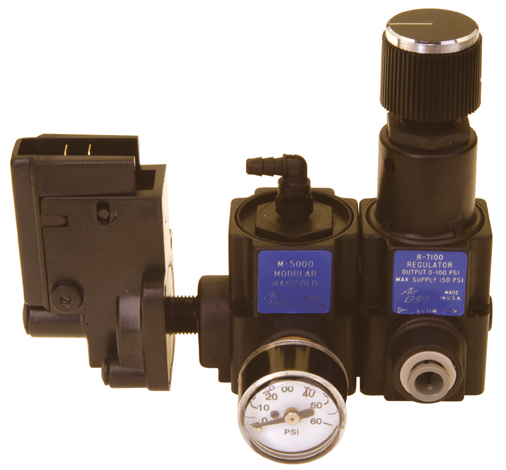 The Regulators and Manifolds can be used individually or assembled into a modular combination of pneumatic components. Modular components include the manifold block, regulators, switches, and gauges. The regulators provide the ultimate in regulation of pressure and feature excellent repeatability, a sensitive 20-turn adjustment and miniature size. The balance of the valve seat gives an output that is virtually unaffected by changes in supply pressure, only 0.1 PSI output change with a 10 PSI supply pressure change. The maximum supply pressure is 150 PSI. Air Logic’s unique dovetail porting system offers threaded ports in 10-32 UNF, 1/8-27 NPT, 1/4-18 NPT, and M5. We also offer ports with the most reliable and cost effective solution for tubing connections, Push-in Fittings. Push-in fittings are available for 1/4” 3/16”, 5/16”, and 5/32” O.D. tubing as well as a variety of metric sizes. Air Logic manufactures switches that interface from pressure signals to electrical control circuits and from vacuum signals to electrical systems. Maximum sensing pressure is 100 PSI or 29.9" Hg. Adjustment ranges are 0.5 to 100 PSI or 1 to 28" Hg. Special actuating and releasing settings are available upon request. 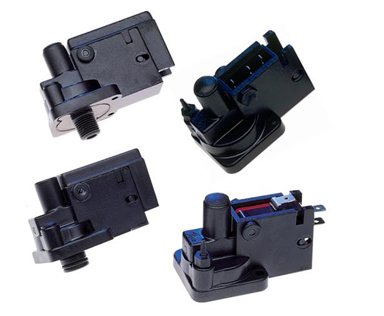 The switches include Miniature Switches, designed for low pressure or low level vacuum applications; they feature sensing pressures less than 15 PSI or 4” Hg. The Subminiature Switches are designed for high pressure or high level vacuum applications with sensing pressures up to 100 PSI or 28” Hg. The Low Differential Switches are designed for a smaller difference between the "ON" and "OFF" actuating and releasing set points. The Solid State Switches is a direct interface with solid state electrical circuits. Air Logic manufactures a variety of pneumatic accessories that are ideal for instrumentation and medical applications. The accessories include Preset Flow Controls, Filters, Orifice Restrictors, Needle Valves, and Check Valves. The Preset Flow Control maintains a constant flow in one direction and full flow in the opposite direction. Orifice sizes from .004” to .040” are available. The miniature Filters are designed to remove most contaminant particles from compressed air systems. The filters feature 5, 25, 43, and 73 micron Dutch Weave stainless Steel filter screens. The Orifice Restrictors offer precise flow control and are precision molded of Polysulfone. Models are available for inline and 10-32 UNF applications. Orifice sizes range from .004” to .040”.